TERRACOTTA VILLA | Luxury Waterfront Bayside Island Vacation Rental | 100% Accurate Calendars, Price Breakdown, Online Booking | Vacation Villas of South Padre Island powered by EZBookVacationHomes.com...Featuring Luxury Vacation Rental Home on South Padre Island Terracotta Villa Sleeps 10, Bayfront yard and Patio with Million dollar view! Newly Remodeled. Featured on HGTV! Larger groups book 2 of these beautiful villas and sleep up to 16 guests! Pool, fishing dock, community boat slips, watch the sunset and fireworks right from your bayfront patio and lawn! 3 Block walk to: live music at Laguna Bob, mini golf at gravity park, and beach across the blvd. Located at middle of the island: La Solana Condominiums.. Speak to Jan and Cianna for details and personalized service. Let us help you make vacation planning a breeze. Newly Remodeled in great location;;Was the featured Home on HGTV Beach front Bargin Hunt TV Show Bayfront patio and lawn. Walk to Entertainment District for live music. Fireworks over the water. SEE IT BEFORE AND AFTER! Before ---HGTV "BEACH FRONT BARGAIN HUNTS"
After -----You See it here!!!! EPISODE Me and Me Madre in South Padre!! REVIEW Cianna, I just wanted to drop you a quick note and tell you THANK YOU! Our stay at the "Terracotta Villa" was absolutely magical! The condo was beautiful and the views are fabulous! My husband and I can't wait to come back and enjoy the sunsets on the patio! Thank you for making our 10th anniversary absolutely perfect! Sincerely, June P.
We had a lot fun and the condo was beautiful. WINTER 2 BEDROOM AND OR 1 BEDROOM OPTIONS DESCRIBED BELOW!! Vacationers of South Padre Island! Waterfront with Boat a boat dock! Boat rentals available!! Terracotta Villa is one of our newest properties, and is luxurious and newly remodeled! This serene bay front villa has a Spanish colonial style where your group can enjoy this million dollar view on the bay. Watch the sail boats pass as the sun sets over the water and listen to the sound of birds and rustling palms in the warm breeze. Have a larger groups???? book 2 of these beautiful villas side by side here at La Solana and sleep up to 16 guests? #1 Two king suite with bay view. Private Entrance... Lux Guest Room with full bath. Can be 2 king and or 1 king and 2 twins depending on how you set up the day bed.... super comfort with spa bedding....in suite bathroom and rain shower. Beautiful Bay View and Private entrance. Bikes and Paddle boards are availalbe at a modest fee. Your 7th night is free when you reserve a full week. Talk/text Jan or Cianna for more information. Please call 281-222-0432 for RENTAL DETAILS. We would love to host you stay and enjoy Terracotta Villa. ATTN Hotel bath sets and paper products Linens and Towels and pool towels are provided... We "do" have a fully equipt kitchen plates, bowls, utensils, cookware, etc. that provides for maximum occupancy, BUT please bring extra supplies and items you want to make sure you have during your vacation. Extra paper towel and tissues, paper plates, paper napkins solo cups etc. Make sure to bring electronic devices, music, and gaming, computers and video to TV cables are great and dvd movies. Caretaker House keeping optional. 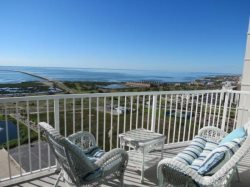 10 minutes walk to beach with boardwalk access.